The right-hand fast bowler has 50 wickets in 33 combined games in first class, List A and T20s. 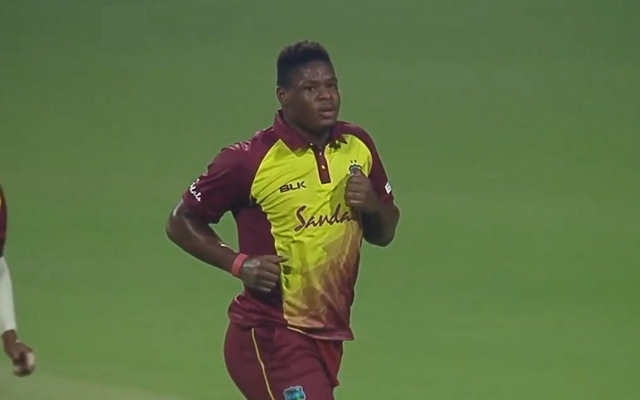 Young Windies fast bowler Oshane Thomas has impressed one and all with his pace in the ongoing tour of India and a number of former cricketers have wished that he receives a contract in the Indian Premier League (IPL) soon. After playing in two ODIs in the five-match series, Thomas made his T20I debut in Kolkata on Sunday and gave an impressive performance with the ball even things looked bleak for his side. One of Thomas’ high points is his speed and the cricket-lovers have loved his game for he revived the most common memory which is attached with Caribbean cricket – fast bowling. Thomas has pocketed four international wickets so far (two in T20Is, two in ODIs) and of those, three have been of ace Indian opener, Shikhar Dhawan. The batsman, who won the man of the series award in Asia Cup in September, was cleaned up all three times by Thomas on the tour. The fourth has been Rohit Sharma, who is captaining India in the T20I series. Former Indian opener Aakash Chopra – a cricket commentator and analyst now – also spoke highly about the exciting talent in Thomas. In a humour-filled tweet, Chopra said Thomas should be fined for overspeeding since he bowled only one ball below 140 kmph in the first T20I played in Kolkata. He then said he would love to see the bowler featuring in the next season of the IPL. The Jamaican was first spotted by Windies great Chris Gayle and the latter at once recommended his name for the Jamaica Tallawahs in the Caribbean Premier League. He has done decently in that tournament though he hasn’t played much of first-class and List A matches. The right-hand fast bowler has 50 wickets in 33 combined games in first class, List A and T20s. The world will be hoping that the fast bowler excels more for his national and club sides and bring back some hope for bowling in the game which has become extremely batsman-dominated.